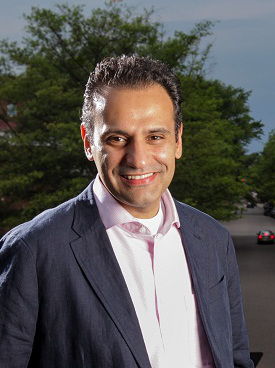 Fouad Fakhouri (M.M.-Composition/Theory '97, M.M.-Orchestral Conducting '01) has received an honorary “Doctor of Humane Letters” degree from Methodist University (North Carolina). As part of that honor, he delivered the fall commencement address at the university. Fakhouri serves as music director and conductor of the Fayetteville Symphony Orchestra —an appointment received in 2004. The internationally acclaimed Lebanese-born American conductor and composer has been credited with raising the artistic standards of orchestras that he conducts while dramatically increasing symphony attendance. He is the fifth music director in the symphony’s 58-year history, and his work continues to receive accolades for “musical accuracy” and “emotional intensity.” “When he waves his baton, you get the feeling that Maestro Fakhouri is summoning forth musical notes born in each musician’s soul,” writes the Fayetteville Observer. Born in Beirut, Lebanon, Fakhouri was trained on the piano and is the fourth generation in a line of musicians and composers. He received his bachelor’s degree in music theory and composition from West Texas A&M University, and holds a master’s degree in orchestral conducting and master’s degree in composition/theory from Penn State. He received his doctorate in composition from the University of North Texas. Fakhouri currently resides in New York City with his wife, Diane Lavelle-Fakhouri, and their daughter, Isabella Margaux.